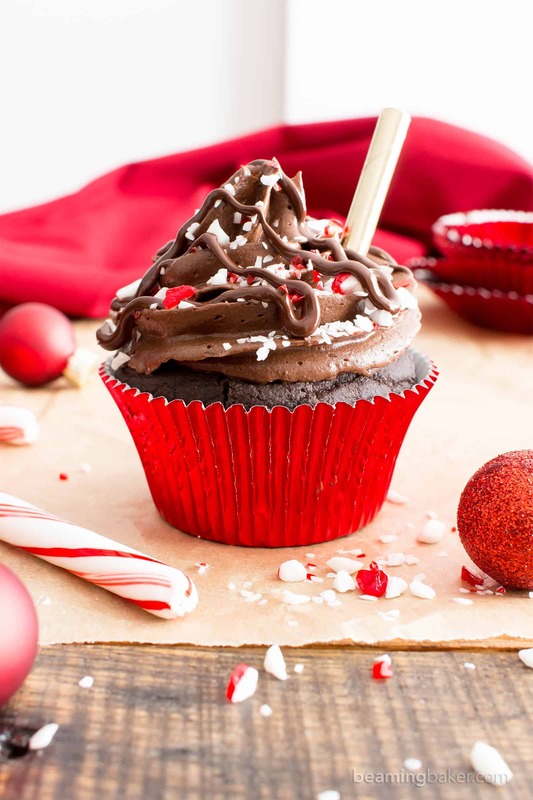 Vegan Peppermint Mocha Cupcakes (V, GF): a festive recipe for rich ‘n moist chocolate cupcakes bursting with peppermint mocha flavors and topped with rich, smooth frosting. Vegan, Gluten-Free, Dairy-Free. 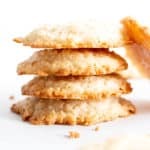 This post is in partnership with and sponsored by Simple Mills. 1) This is the first time ever that I’ve shared a post on a Tuesday. Okay, fine, that’s not that interesting, but it is… something! 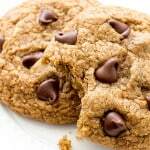 Something, indeed… Quick, anyone totally disoriented or hopefully/actually pleasantly surprised about this Tuesday treat? 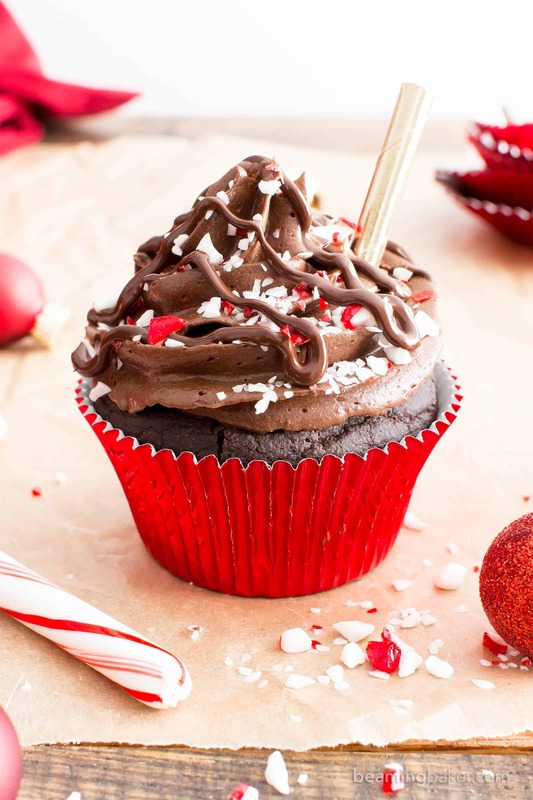 2) Today, I’m working with a very special brand, Simple Mills, to bring you one of the tastiest, allergy-friendly, super-fun-to-make festive desserts of the season: Vegan Peppermint Mocha Cupcakes, made with luscious Simple Mills Chocolate Frosting! ???? 3) It’s only 13 days ’til Christmas and just 14 days ’til National Candy Cane Day! High-five to you if you already knew this—about National Candy Cane Day and not Christmas. Ahem. This means that we have less than two weeks to prepare, menu-plan, bake, dry run bake, then finalize bake our elaborate dessert menus for the season. Wait, is it just me that focuses solely on the dessert menu? Well, every year, I focus mostly on making cookies and candy. All the while, I walk enviously by bakery cases, staring at (let’s face it, drooling over) the gorgeous, show-stopping cupcakes sitting patiently there, waiting to be brought home. I end up wanting desperately to make cupcakes for the holidays, but feeling a tad hesitant about all the work that goes into it. And every year, I’m like… “Once in a while, it would be really great if I could just have a little bit of help in the kitchen.” Ya know? Sometimes, it’s okay, nay—necessary, to skip having to make everything from scratch! Like, whyyyyy can’t I stop by the store and just pick up a teeny, tiny helper (i.e. pre-made frosting) to help a girl out? And then, I go to the store, look at all the non-vegan, non-gluten-free frostings and sigh. Then, then, I read the ingredient label for that one can of frosting way in the back of the health food store and wince because it’s definitely made with ingredients no one’s gonna feel good about. But this year, that’s changing. Cue the celebratory horns!! 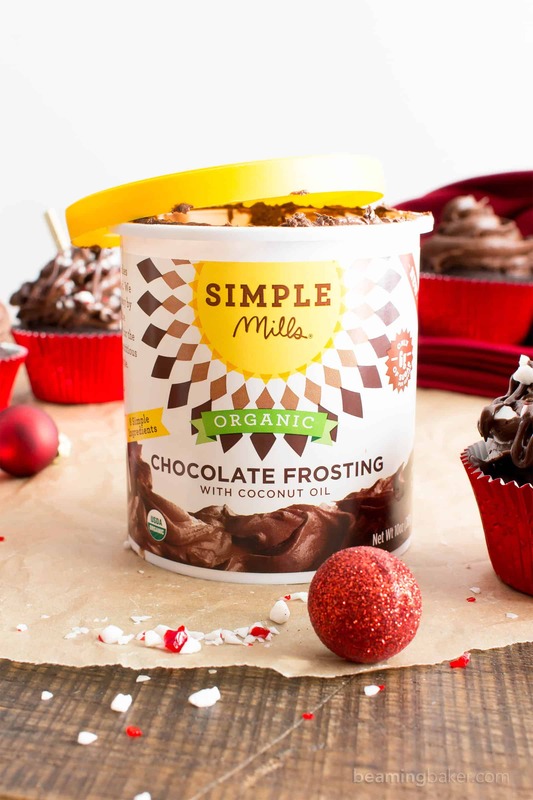 Creamy, satiny, and SO chocolatey: Simple Mills Chocolate Frosting! What’s that I hear in the background? Oh yes, it’s Santa high-fiving his elves and throwing out his super snazzy bake scheduler. Do you think his scheduler has multi-colored sticky notes and synchronized timers? 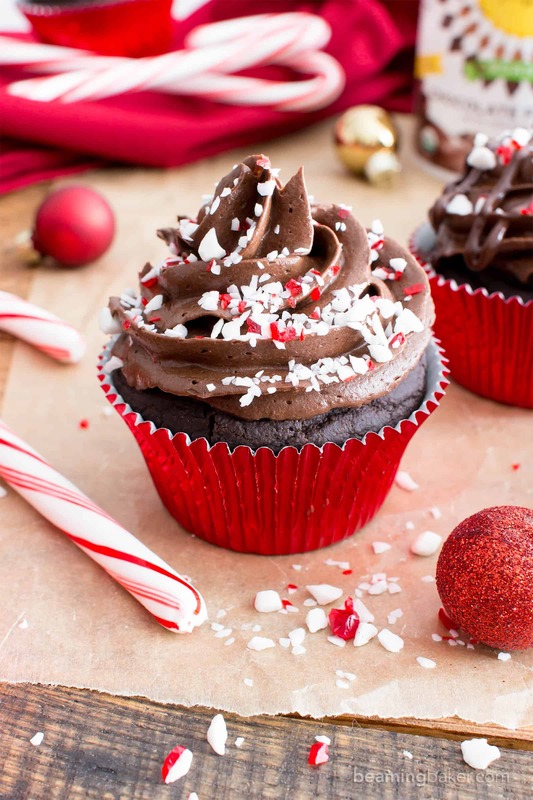 Before we get totally off-track discussing the best organizer for recipes/menu-planning/life-bossing, let’s talk about the finest points of these Vegan Peppermint Mocha Cupcakes. Also, do tell about your beloved life planner! I’m all ears! So are you ready to surprise, please and awe-to-the-max all of your friends and loved ones? You grab the red foil cupcakes liners, I’ll grab the cocoa powder! Let’s do this! It’s simply one of my greatest joys to share these feel-good recipes with you. This time of year is so much better when we’re sharing and giving… especially sweet treats, don’t you think? What’s your favorite way to enjoy peppermint mocha? 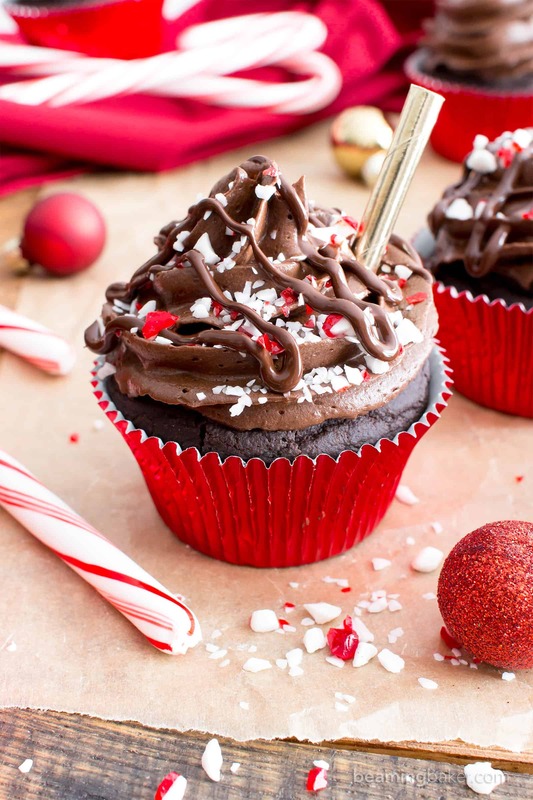 Vegan Peppermint Mocha Cupcakes (V, GF): a festive recipe for rich ‘n moist chocolate cupcakes bursting with peppermint mocha flavors and topped with rich, smooth frosting. Vegan, Gluten-Free, Dairy-Free. Make the cupcakes: In a large bowl, sift together the dry ingredients: oat flour, cocoa powder, baking soda, instant coffee and salt. In a medium bowl, whisk together all the wet ingredients: coffee, milk, oil, sugar, maple syrup, vanilla and peppermint. Whisk until well incorporated. Pour batter evenly into prepared muffin pan—filling each cup about ¾ of the way. Bake for 16-20 minutes. Mine took 18 minutes. Test for doneness with a toothpick. The toothpick should come out with a few moist bits of cake on it, but no liquidy batter. Place muffin pan on a cooling rack to cool for 30 minutes. Remove cupcakes from muffin pan and continue cooling on rack for 1-3 hours. Cool completely before frosting. 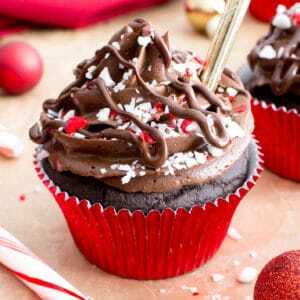 Frost the cupcakes: In a large bowl, or the bowl of a stand mixer, add frosting and peppermint. Using a hand mixer or stand mixer with a whisk attachment, beat together until fluffy and well mixed. Frost completely cooled cupcakes. Top with crushed candy canes. Melt the chocolate using the double boiler method or do the following. Add chocolate to a small, microwave-safe bowl. Heat in 20-second increments until melted. Stir in between increments, until smooth. Transfer melted chocolate to a small drizzling bottle or to a small zip bag with a tiny corner trimmed off. Drizzle cupcakes. Enjoy! Storing instructions below. - Adapted from my Vegan Gluten Free Chocolate Cupcakes. 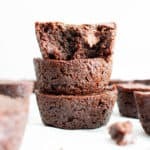 - Try Simple Mills Chocolate Muffin & Cake Mix for a fast ‘n easy timesaver! - Storage notes: Store in an airtight container in the refrigerator for up to 1 week. Okay to keep at room temperature for up to 3 days, in a cool, dark environment. 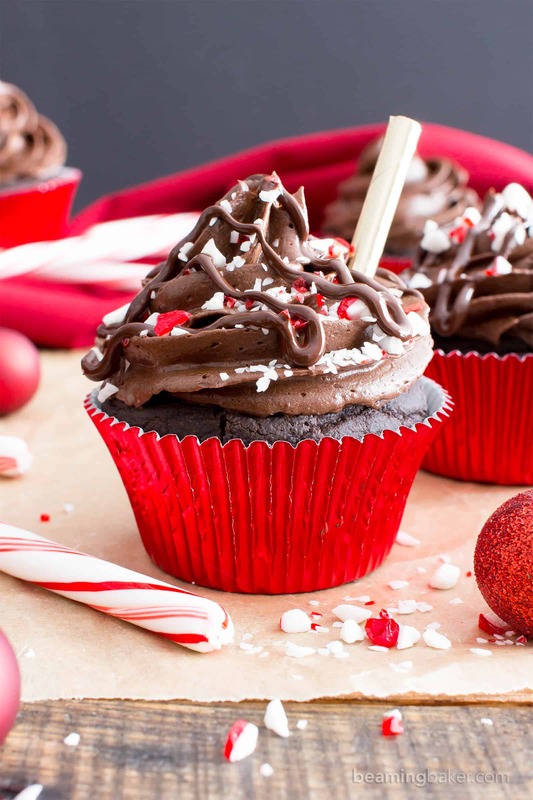 If keeping a few days before serving, wait to decorate with candy canes and melted chocolate until day of serving. - Freezing Instructions: Store frosted cupcakes in an airtight, freezer-friendly container for up to 1 month. Allow to thaw at room temperature for 1-2 hours before enjoying. 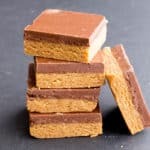 - More Festive Gluten Free Vegan Treats: Peppermint Mocha Frappe, Peppermint Fudge, Peppermint Ganache Brownies. In partnership with Simple Mills. This post contains affiliate links, which allow me to make a small commission for my referral, at no additional cost to you. 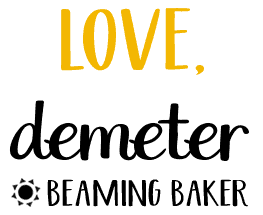 Thank you for supporting Beaming Baker. Oh my goodness! 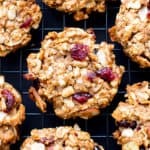 These look like the perfect holiday treat! I love they are vegan. Oh. My. GOODNESS! These beautiful cupcakes are vegan? 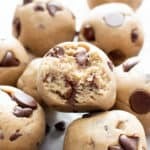 I am definitely going to make these. I checked and my local grocery store stocks this Simple Mills brand! I’m super excited. Thank you for this recipe!! These sound AMAZING!! 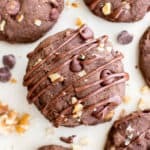 I’m a huge fan of anything with chocolate and peppermint so I’ll have to try these! Thanks Mindy! Chocolate and peppermint is absolutely one of the BEST holiday flavors! Enjoy! chocolate and peppermint is such a classic combination and my daughter happens to LOVE IT. She’s coming home from college today — I know she’d love these as a treat! Perfect! I know she’ll just love these. 🙂 Have a wonderful homecoming & enjoy! These cupcakes look so decadent! I’m totally drooling over these cupcakes!! Those cupcakes are gorgeous! Chocolate and peppermint are so good together!! What a gorgeous cupcake! 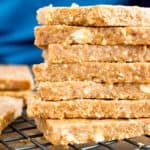 I love that you shared this great vegan recipe!! I love cupcakes! 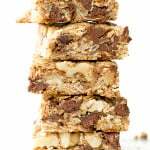 I am always looking for new recipes! Hope you just love this one, Catalina! Those cupcakes look ah-mazing! I will definitely put these cupcakes on my list of Beaming Baker recipes that I must make! I love the frosting and topping ideas! Thank you for your brilliant ideas! 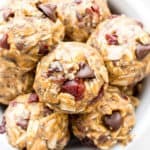 I’ve already made a few of your recipes and have loved them all! Pinned! They look so decadent and CUTE!